A well-established journal with over thirty five years' coverage extending across the whole range of pure mathematics, together with some more applied areas of analysis, theoretical computing and mathematical physics. 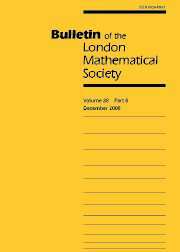 The London Mathematical Society has adopted a trial open-access policy for 2005, in which the most recent two issues will be freely available online as part of a one year experiment. The Bulletin publishes important short research articles, authoritative survey articles and advanced expositions, often of an extensive nature, reviewing all major developments in an important area over many years. Occasional biographical articles are also published on the lives and mathematical achievements of distinguished mathematicians. The Bulletin has a substantial book review section, including books in applied mathematics and statistics as well as pure mathematics.